Please the whole crowd with these Bacon-Wrapped Hot Dog Bites. 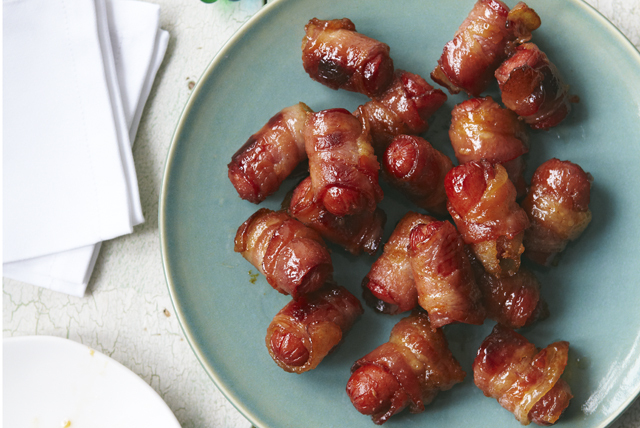 These Bacon-Wrapped Hot Dog Bites are Baked with sugar and spice and everything nice. Wrap 1 bacon piece around each wiener piece; roll in combined sugar and pepper to evenly coat. Place, seam-sides down, in foil-lined rimmed baking sheet. Bake 22 to 24 min. or until bacon is crisp and golden brown, turning after 12 min. Since the brown sugar glaze is sticky, lining the pan with foil makes cleanup a snap!